Since you tend to become emotional at these Masonic ceremonies...you should probably let someone else actually sacrifice him to the Dark Lord. so many aprons but nobody cooking anything. Spirit cooking is at 11. It’s a potluck, so bring a pot about the size of normal human entrails. If you need a size comparison a picture of one will be carved in your back by our dark lord in exactly 10 minutes. Yes, it has come time to give back to what has given me so much. 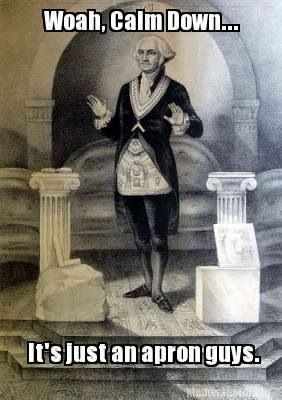 I have been blessed with three children, one of which is a boy and has just petitioned for the degrees in masonry. I'm very proud to have him want to take this step. He has asked a lot of questions over the years and hearing him talk about it when he finally asked the right question, was something I wish everyone could feel. He watched my journey unfold while he was growing up, asking me why I was always going to the lodge, and listening to my explanations of how I was helping to make other men masons, as many men did for me. I was pretty active as my mentor had me at the Senior Stewards station soon after my being raised and 6 years later, I was master. So I spent a good bit of time with masonry just after I joined. I think that part turned him off at first, as he thought that was just how masonry was. I explained that you don't have to go full commando right off the bat, and easing into it is perfectly fine, as long as you don't loose sight of the useful and valuable tool. But after having the second in command to Balphomet ask me a question, it occurred to me that I am confused as to the answer. What part will I play in the raising of my son? (BTW, it was Augustus who asked me, but you already knew that from the introduction) Obviously, I will raise him, but what other part would be best to do? I suggested Senior Deacon, but I feel that job would be best done by a stranger to him, as to impress that particular lesson. I'd like to present the Apron, but with such an emotional thing, and being a giant crybaby, I'd never make it through the second sentence. So as a mason, if you were pressed with this conundrum, what would you do? I don't want to be un-inclusive to those who aren't masons, but this concept is and should be abstract to you, by design. I think you are conflating Baphomet and Baal? I am not an expert, but I think masons are with Baal and satanists are with Baphomet? That's a gross generalization above ^^^ but it was the satanists that just put up that Baphomet statue (and are sueing Netflix over copy write over it). And, I used to see a guy with all kinds of mason sticker badges on his car with BAAL as his license plate all over the place. This leads to my question: Is there a connection in Masonry with Baal? Not like you'd talk about it amirite! Sorry the B-B-Q is over, just a few bones to pick over LOL! What a weird thread.. It's like all of the regulars we see post on here all of the sudden come out, like some dark agenda. lol I too thought Baphomet was a Satanic thing? These "dark" lords and false gods are the fallen angels from the Bible! Source? And not some right wing biased opinion piece either. I want something reputable like CNN or MSNBC. I have to ask this,is this a joke or are you serious about this? One who clearly has no sense of humor.